The FA Project is a proud supporter of FARA. Join the FA Project for our 6th Annual Striking Courage Bowlathon on April 18, 2015 from 7-11pm at Candlewood Lanes in North Reading, MA. Tickets are $25 and include a fun-filled evening of unlimited bowling, delicious food catered by the famous Kelly's Roast Beef, great raffles, T-shirts, photobooth and a DJ! Also included: cash bar, soft drinks, water, wine and a special seasonal offering by local brewers Wormtown Brewery and Samuel Adams. Join the fun and bring friends! This is a 21 plus event. If you'd like to sponsor this event, you can send a check made payable to The FA Project Inc. or sponsor online at www.THEFAPROJECT.org/sponsor.html. All sponsorships are also tax deductible (TIN: 26-4373585). As a platinum sponsor your name will be posted above a lane during the event, printed on the back of a T-shirt and a link to your business on our website. As a gold sponsor your name will be posted above a lane during the event and a link to your business on our website. As a silver sponsor your name will be posted above a lane during the event. More FA Project fundraisers are in the works! Please check back soon, as we hope to have plans for upcoming events posted shortly. Can't make it to an event? You can still support The FA Project! Join the FA Project for our 5th Annual Striking Courage Bowlathon on April 12, 2014 from 7-11pm at Candlewood Lanes in North Reading, MA. Tickets are $25 and include a fun-filled evening of unlimited bowling, delicious food catered by the famous Kelly's Roast Beef, great raffles, T-shirts, photobooth and a DJ! Also included: cash bar, soft drinks, water, wine and a special seasonal offering by local brewers Wormtown Brewery and Samuel Adams. Join the fun and bring friends! Tickets can be purchased online until April 8, 2014. This is a 21 plus event. Since 2009 The FAProject has donated travel grants annually, which provide financial assistance to attend the Friedreich's Ataxia Symposium sponsored by the Children's Hospital of Philadelphia held during the fall each year. We know first-hand the sense of unity and camaraderie felt to socialize with everyone from patients to doctors working on curing this disease along with seeing the pipeline of potential treatments presented by FARA, advocates, leading medical professionals and doctors worldwide! Below is an email sent by one of our 2013 recipients. I don't have a Facebook page so I can't post on there, however I will gladly tell you about my experience, and you can share it on your Facebook page or with the FA project. It's an unexplainable feeling being in a room filled with people who share your struggles. I've never felt so comfortable being a FAer. 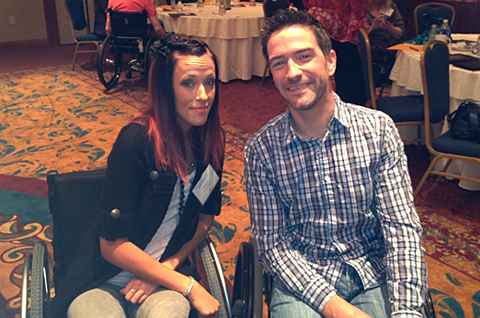 I met some of the most inspirational people in the world. Some I had spoken to before, and finally got the opportunity to meet. Others were fresh new faces. Meeting Kyle Bryant was like meeting a celebrity! I was shocked! I learned some fantastic information, and met a FA genius, Dr. David Lynch... Who I plan on seeing next year! I never wanted to leave. At one point, I said "we should just build a FA apartment complex so we can all be together!" I am going to spend the next year saving money so I can attend again! I can honestly say, for the first time in my life, I left this event with hope. Thank you for everything! The FA Project made a dream come true! Join the FA Project for our 4th Annual Striking Courage Bowlathon on April 6, 2013 from 7-11pm at Candlewood Lanes in North Reading, MA. Tickets are $25 and include a fun-filled evening of unlimited bowling, delicious food catered by the famous Kelly's Roast Beef, great raffles, T-shirts and a DJ! Also included: cash bar, soft drinks, water, wine and a special seasonal offering by local brewers Wormtown Brewery. Join the fun and bring friends! Tickets can be purchased online until April 5, 2013. This is a 21 plus event. In 1998, my husband was diagnosed with Friedreich's Ataxia, a progressive life altering disease that causes damage to the nervous system. Ever since then, we've been searching long and hard for ways to fight this terrible disease. We reached out to friends and family and through our combined efforts we founded The FA Project, Inc. The FA Project is a 501(C)(3) Charitable Organization committed to raising awareness and helping those afflicted with Friedreich's Ataxia. During the past four years our all-volunteer organization has raised over $75,000! These funds have been distributed directly to the FA community and supported those affected in a variety of ways. You can help us in many ways. One is through a donation. (TIN: 26-4373585), and your generosity will play a role in the efforts to help those afflicted with Friedreich's Ataxia live the best life possible. 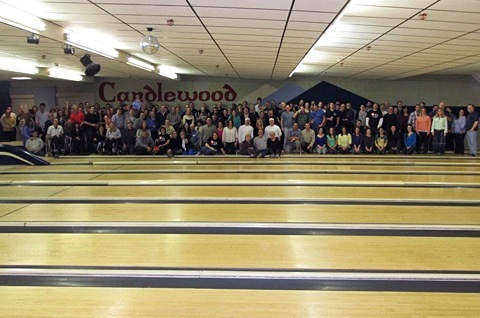 If you'd like to sponsor our upcoming Annual Striking Courage Bowlathon on April 6, 2013 at Candlewood Lanes in North Reading, you can send a check made payable to The FA Project Inc. or sponsor online at www.THEFAPROJECT.org/sponsor.html. All sponsorships are also tax deductible (TIN: 26-4373585). Thank you so much for your support, please respond by March 22, 2013. 3rd Annual Spring Bowlathon, A Success! The FA Project was honored to have new and existing supporters to their annual Spring Bowlathon. As with past years, we played to a sell out crowd and sought out a great array of raffle items, tasty food & drinks and of course friendly bowling! Many thanks to all those that attended and donated, see you next year! As the sun set over the Boston skyline on Saturday, Boston's Best Cruises' Voyager III set sail for an evening of generosity and hope. On board, guests for The FA Project's first ever Fundraising Cruise joined together to enjoy a harbor cruise and support the work of tireless advocates Richie Currier and his wife Maria. Starting in Boston, the Voyager III headed to Winthrop to pick up guest of honor, Richie, and his family. The backdrop of the lights of Boston and a crisp early fall breeze along with Boys Like Girls guitarist Paul DiGiovanni's jazz music stylings set the tone for a perfect night to mix and mingle with FA supporters, Richie and the Currier family and be in the company of friends with a common goal. Guests were also treated to the premiere of "There is No Limit" a movie trailer show, edited and directed by Laidlaw Group, chronicling Richie's daily life and the incredible feats he and The FA Project have been able to accomplish to support individuals suffering from Friedreich's Ataxia. Glancing around at the attendee's faces as the trailer played, it was impossible to miss the clear sense of admiration and awe all attendees felt for the guest of honor. 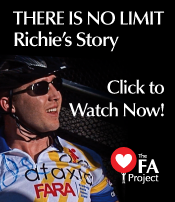 Despite his own personal struggle with FA, as the trailer showcased, Richie's focus is never on himself but on how he can better the lives of others. Focusing on the blessings of his wife Maria and his children, his entire family and the wonderful support from his co-workers at the State including his friend and adviser, Brian Hickey, Richie spoke only about continuing forward with The FA Project, reaching out to more sufferers of the disease and improving their lives. Boston's Best Cruises is supporting the FA Project this summer, donating a portion of their Harbor Cruise and Sunset Cruise ticket sales to the organization. 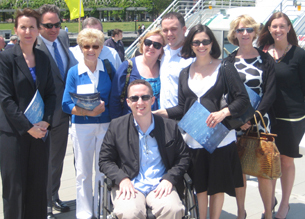 By doing so, Boston's Best Cruises wants to help increase awareness, as well as raise money for individuals and families that have been affected by Friedreich's Ataxia. The Harbor Cruise is a brief voyage out on the water that provides those aboard with rich history and mythology about the Harbor and the city of Boston. Departing on the hour behind the Marriott Long Wharf Hotel, the Harbor cruise gives passengers spectacular views of Boston. The Sunset Cruise sets sail in the evening, providing food and drinks along with plenty of deck space to view the city and its surroundings. Go online to buy your tickets today! The FA Project is proud to report to you, our supporters, that the 2011 Striking Courage Bowlathon was a great success. On the evening of April 9th, 120 participants enjoyed laughter with friends both new and old while bowling strikes, spares (and even some 'gutter balls'). Everyone enjoyed catered food provided by the World Famous Kelley's Roast Beef and washed it all down with donated ice cold seasonal selections from our friends at Samuel Adams. The culinary portion of the evening was topped off with donated baked goods provided by Mrs. Limone and Mrs. MacNicholas. The evening was highlighted by a visit from a very special friend of the FA Project and the unofficial spokesperson for the FA movement, Kyle Bryant. As usual Kyle delivered a hair raising depiction of his justifiably optimistic view on the state of Friedreich's Ataxia and those who it effects. Kyle could would benefit from a sponsorship with Kleenex as typical with his speeches their wasn't a dry eye in the house. His hope and inspiration is unmatched. The FA Project is proud to continue to support his efforts at FARA as well as the Ataxian Athlete Initiative. 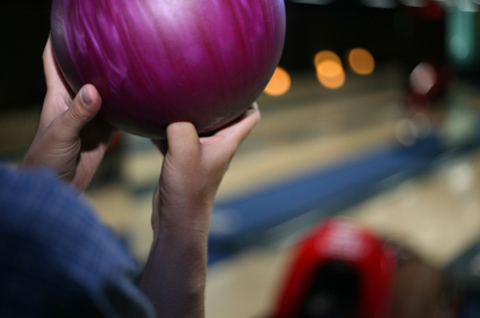 This year's Bowlathon will serve to assist those dealing with FA through the provision of lifestyle enhancements. The event humbly raised $5,600, all of which will be provided back to the community. We are excited to share the upcoming giving opportunities as they are performed. Special thanks to those volunteers who assisted with this year's event (Plourde Family included!) as well as our many Lane Sponsors (more info to come soon!). Lastly, the event would not have been possible without the tireless efforts of two FA Project members, Rich and Anna Limone. We are very fortunate to have them aboard our team. 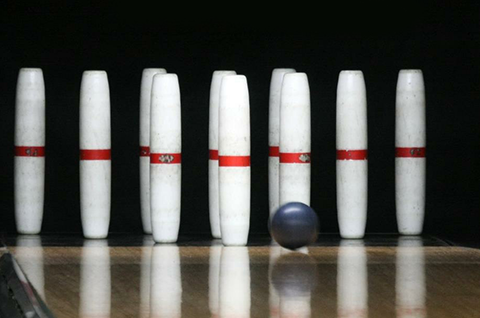 We look forward to next year's Bowlathon and this year's other events! New FA Story: Meet Sue! The FA Project is happy to post another inspirational story about one of our scholarship recipients. Please take a look at our latest FA Story "Meet Sue"! And visit back soon to learn more about our upcoming fundraising events and support opportunities. 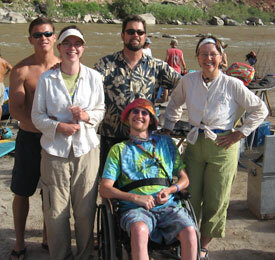 Visit theataxian.com to learn more about Kyle Bryant's amazing story of courage and hope. Watch a trailer for Kevin Schlanser's feature length film about Kyle's upcoming Ride Across America. "This is a story of hope. An emotionally charge triumph of the human spirit, re-defining what it means to have a disability of any kind and perhaps, what it means to be truly alive." Go Kyle! Thank you for visiting The FA Project website. We invite you to explore our website to learn more about Friedreich's Ataxia and look forward to celebrating our first year of success with you. And please don't forget to check out our Events page for our upcoming fundraising events before you go! Help those afflicted with FA. Donate today! To make a PayPal donation to The FA Project, please click on the button provided below. Feel free to contact us if you have any questions. We are very grateful for your support.